Want to know about carbon fiber composite material? what is Carbon fiber? How Carbon Fiber is made? or Where to get carbon fiber? This is our web page dedicated to sharing information about carbon fiber with you, and to give you a better understand of this composite matierial. It is our intention to use this webpage to provide you with all the information you need to know that will allow you to make an informed decision about carbon fiber and whether it is suitable for your application. As one of the few Authorized Hexel Distributors, the Carbon fiber fabric, Fiberglass cloth and other composite materials we sell are all available in cut yardage for small projects done by the at home do-it-yourselfer, and in full rolls for companies interested in high quality American made carbon fiber and composite fabrics, sold at a low price. Many people have asked us, "what is carbon fiber? ", and "how is carbon fiber made?" This article has been written to answer your questions about carbon fiber. Carbon Fiber is a woven cloth made from carbon filaments. Carbon fiber has traditionally only been available in black, but has recently been available in colors such as blue and red. This has resulted in the availability of colored carbon fiber hoods. 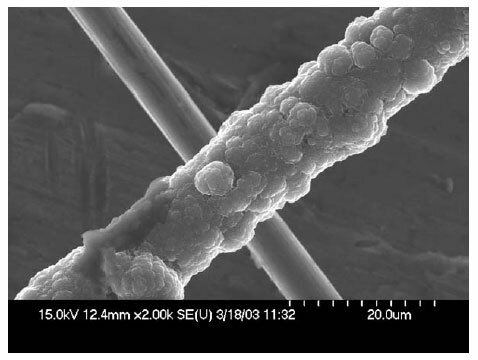 Carbon filaments are often made from the oxidation and thermal pyrolysis of polyacrylonitrile material. Polyacrylonitrile is a acrylonitrile-based polymer used in the creation of some synthetic materials. Polyacrylonitrile molecules are made of long chains which are aligned by drawing continuous filaments. When these chains are heated under the correct conditions, they bond side to side forming ladder polymers. Narrow graphene sheets are formed which merge together to make a single round filament. This product is approximately 94-95% carbon. Instead of polyacrylonitrile, pitch or rayon can also be used, although this produces a lower-quality fiber. If the carbon is heat treated in the range of 1500-3000 degrees celcius, the fiber can become a higher strength, higher modulus product. The highest tensile strength (>800,000 psi) can be created by heating the fiber between 1500 and 2000 degrees. The highest modulus of elasticity (77,000,000 psi) can be obtained by heating the fiber material from 2500 degrees to 3000 degrees. This balance between strength and elasticity is what allows a carbon fiber hood to be so strong, but also so durable. Carbon fiber density is about 1740 kg/m3. The three kinds of carbon fiber are standard modulus, intermediate modulus, and high modulus. Tensile strength tends to vary between 2000 MPa and 7000 MPa. Rayon used to be a more popular precursor for carbon fibers and is still used on some applications like rockets. However, it is not much more common for PAN, or even pitch, to be used. The fiber yarns can be processed in many ways. Some examples of processing techniques are: filament winding, weaving, braiding, prepeg carbon fiber ( pre impregnated carbon fiber), and pultrusion. The filaments created in the manufacturing process are stranded into yarn. This yarn is rated and classified by its linear density, or by filaments per yarn count. Linear density is determined by weight per unit length =1 g/1000 m = tex. The number of filaments per yarn count are counted by thousands. For example 100 tex for 1,500 filaments of carbon fiber is 1.5 times as strong as 500 carbon fibers, but is also 1.5 times as heavy. 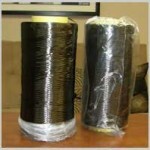 The thread can be used to weave a carbon fiber filament cloth or fabric. The pattern on the fabric is generally dependent on the density of the yarn and the weave chosen. Where's the carbon? If you have been looking for carbon fiber composite material, you have probably noticed that it is hard to find. Where does all of this carbon fiber go? Well, believe it or not, there has been a worldwide shortage of carbon fiber because it is being bought by three main users faster than it can be produced. The first is the military. Since carbon is up to 100 times lighter than some metals, it is ideal for aircraft. The F-22 Raptor has over 350 carbon/epoxy parts. Nearly 1/3 of the Joint Strike Fighter Plane will be made of carbon and fiberglass. Besides these two aircraft, carbon is also used for Blackhawk helicopters,body armor, helmets, holsters, and countless other military applications. These applications are on top of the already huge use of carbon in stealth technology. The second big buyer of carbon is the Airbus company. The Airbus Superjumbo A380 and A350 are built with a great deal of carbon fiber. The A380 is due to be released this year, so they are still in the production stages. This plane is huge. Note the double row of windows along the whole length of the plane. It will hold 850 passengers and has a wingspan greater than the length of a football field! The third buyer is Boeing. They are making the 787 Dreamliner. It is 50% carbon fiber and is so light that it will be able to fly from England to Australia without refueling. It is just now being built only a few miles from our manufacturing facility. Now that you know about carbon fiber is and how carbon fiber is made; you are probably wondering where to get carbon fiber for yourself? The answer to that is just a click away. ILLSTREET Composites is not only a manufacturer of carbon fiber parts , but is also one of the largest resellers of cut yardage carbon fiber fabric and fiberglass clothin the United States. We also sell all of the materials and supplies necessary to allow you to start and complete your composite parts.